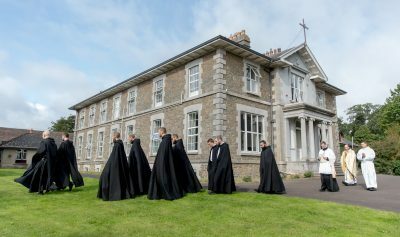 October 19th is a significant day in the history of Silverstream Priory; it also marks the 21st anniversary of Saint Thérèse of the Child Jesus and of the Holy Face being proclaimed a Doctor of the Church in 1979, and the 10th anniversary of the beatification of her parents, Louis and Zélie Martin in 2008. 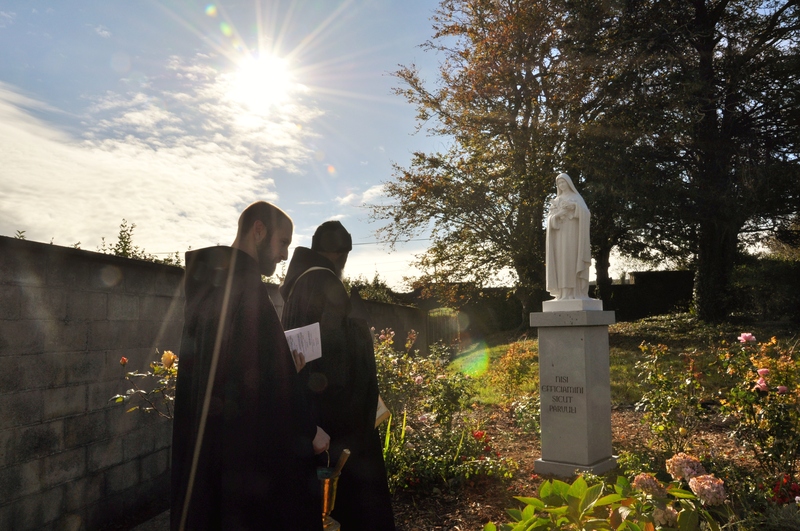 We observed the day by erecting and blessing a statue of Saint Thérèse in the newly designed rose garden adjacent to the noviciate wing. The ceremony took place after None. In 1942, the Hospitaller Brothers of Saint John of God purchased Silverstream from Lord Preston for £2,500, and placed the house and land (170 acres) under the heavenly protection of the Little Flower, Saint Thérèse of the Child Jesus and the Holy Face. Saint Thérèse has watched over Silverstream for the past 76 years. Given that the “Little Way” of Saint Thérèse corresponds in many points with what Saint Benedict calls his “little Rule for beginners,” we thought it fitting to dedicate the new noviciate wing and the adjoining rose garden to Thérèse, the 24 year old Doctor of the Church. 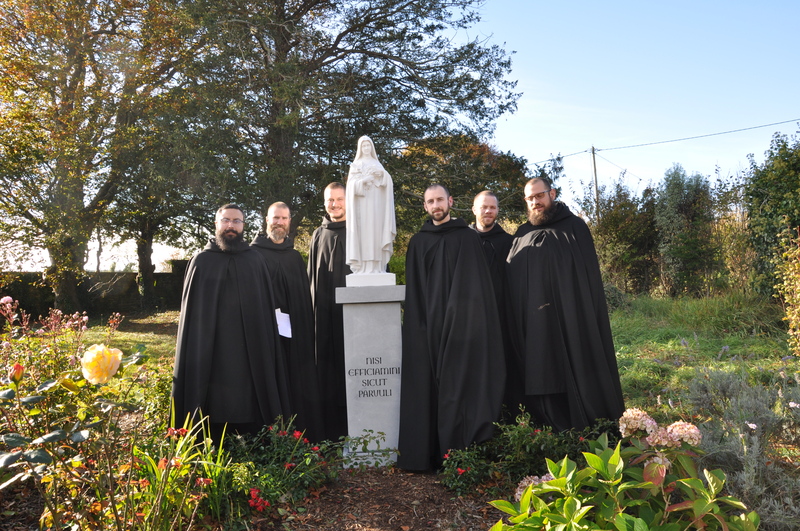 Silverstream’s six novices gather around the statue of their patroness and intercessor, Saint Thérèse. The statue rests on a plinth bearing the inscription, Nisi efficiamini sicut parvuli, “Unless ye become as little children” (Matthew 18:3). The Theresian rose garden is adjacent to the newly renovated noviciate wing.